Is a National Award Winning Publication developed by the Oregon Chapter of the Hearing Loss Association of America. When you are faced with hearing loss, trying to understand what is happening and figuring out what might be helpful can be very stressful. To help individuals and their families dealing with the impact of hearing loss and what help and assistive devices are available, the members of the Lane County (Oregon) Chapter felt that an easy-to-read overview on hearing loss issues and resources was needed. 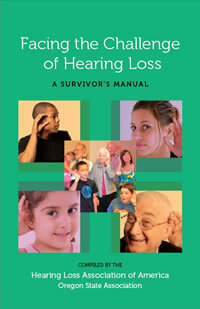 The brief manual provides a non-technical overview of the causes of hearing loss, of hearing aid and cochlear implant technology, assistive listening devices, amplified phones, tips and coping strategies in specific situations, and a listing of resources for individuals who are newly dealing with hearing loss, their family members and care providers. This manual (in it's second edition and third printing) has been very popular. In addition to winning a national award from the Hearing Loss Association of America, we have distributed more than 75,000 copies. It is updated every couple years. ​Vocational Rehabilitation Counselors, Audiologists, Hearing Aid Specialists and other professionals who work with hard of hearing and late deafened people find these books to be wonderful resources for themselves and their clients. Many people have ordered additional copies to share with family and friends. Hearing Loss Association of Oregon. Alternatively you can contact ﻿info@hearinglossOR.org﻿ or call (541) 220-8541 to place an order.